Bell peppers are on their way out! Of season that is. Definitely not out of style. Depending on where you are, wrinkly bell peppers might be on sale; At the farmers market, in your CSA box, or maybe you’re lucky enough to have a garden and a few left hanging on the stalk. I just picked up 4 organic peppers at the farmer’s market for $2. A very good deal for organic peppers. Otherwise, year round your local veggie store might have bags of slightly older peppers on sale. One veggie store I know sells bags of about 6-7 very useable, but older, peppers for $2! But what to do with those wrinkled bell peppers once you've found them (either in the store, or the back of your fridge)? Here are a few things I like to do to make use of, or preserve peppers when I get a bumper stash of cheap spotty peppers. 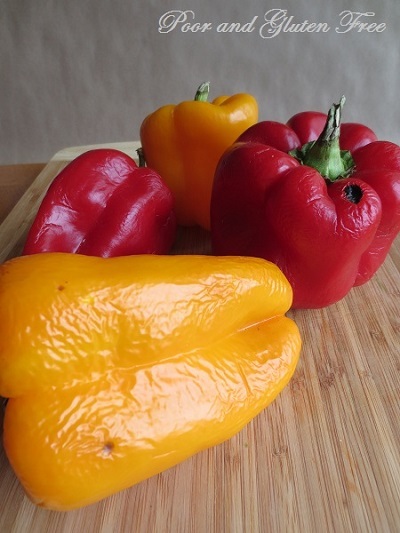 These methods work for any kind of bell pepper, red ones, orange ones, yellow ones, or green ones. How you use your peppers does depend on how many you have. If you only have a couple to play with, you may want to stick to the several options listed that include roasting them. You really need more than a couple to make the other options worthwhile. 1. Roast them and freeze them. This is my fall-back, and is extremely versatile. Roasted peppers frozen in containers or bags can be chopped up and tossed in pasta sauces, soups, sandwiches, and other things for flavouring. Wash your peppers, remove the seeds, cut out any black spot, cut in half and arrange on a cookie sheet covered with aluminum foil. Turn your oven on to broil, and bake the peppers skin side up until the skins begin to blacken. Remove and cover with a tea towel to “steam” the peppers, this will loosen the skins. Once cool, slide off the skins, slice the peppers into strips, and pack into freezer containers or bags. 2. Roast them and pack them in oil. Infusing peppers with the flavours of garlic and rosemary gives them a lovely flavour and they can be used for a variety of things, like sandwiches, pastas and antipasto. Roast your peppers according to the instructions above, then pack in glass jars with a sprig of fresh rosemary and a garlic clove. Fill to cover the peppers with olive oil. This will keep in the fridge for months. 3. Roast them and turn them into hummous or dip. Following your favorite chickpea hummous recipe, and blend in a few slices of roasted peppers for flavour and colour. Alternatively, puree a few slices with sour cream, yogurt, salt, paprika and dill for a veggie and chip dip. 4. Roast them and make soup. Roasted bell pepper soup is a fantastic fall dish. Blend stock with slices of peppers, carrots, celery, and spices for a thick and filling soup. 5. Roast them and eat them! Can you tell I like roasted peppers? I like them roasted as a side dish with a bit of flavouring. Cut the peppers in half, then arrange on a baking sheet covered with aluminum foil skin side down, to create a little bowl. Mix together 2 Tbsp olive oil, a diced tomato, 1Tbsp rosemary, 1/2 tsp salt and 2 tsp finely chopped garlic. Spoon into the bell pepper bowls and bake in a 350F oven for about 30 minutes, until the peppers are soft. 6. Dehydrate them. Dehydrated peppers can be crumbled into bits, then stored and used later to sprinkle over soups, pastas and other dishes for an extra kick of flavour. Wash and slice the peppers in quarters, removing seeds and black spots. Dehydrate according to your dehydrator's directions, or in the oven. 7. Can them. With salt water in a pressure canner, following all standards of safety and hygiene with a tested recipe. If you don't have a pressure canner, you can pickle them. Just be sure to cut a wide swath around the black or moldy spots so you don't contaminate your jar with mold. 8. Pickle them. Peter Piper picked a peck of pickled peppers! Now that that's out of my system, I suggest pickling your peppers in vinegar in a hot water canner, following all standards of safety and hygiene with a tested recipe. As mentioned above, be sure to cut a good chunk around your moldy or black spots so you don't contaminate your jar with mold. What do you like to do with YOUR peppers? Thanks for the great ideas. 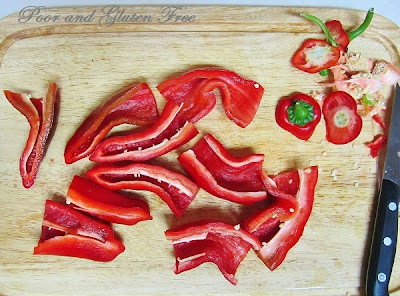 Do you know that you can also just chop or slice and freeze peppers? You don't have to roast them or anything. You do, however, need to double bag them, or they will make your freezer smell like peppers. I do it all the time. I need to try roasting first. Yum! I love the information you have hear! I would love it if you would join Foodie Friends Friday with me at http://FeedingBig. We are always looking for great new tips and recipes! Thanks for sharing your pepper ideas! Thanks for this list. I like the idea of having roasted tomatoes in the freezer. They add wonderful flavor to dishes and having them, on hand, saves time, at the moment. I like to roast them too - but if I get them on sale and don't have time to deal with them before they would go bad - I cut them in strips, or chop them and freeze them on cookie sheets, then package them in freezer bags and use them up in stir frys, soups, etc. It's nice to have some of the food prep already done for you on busy nights. I do the same with onions, if they are starting to grow. I've even chopped spinach and frozen it, when it starts to wilt a little - I use it later in soups and pastas. I love roasted peppers, too! I also freeze raw ones like Heidi; another advantage of double-bagging is that it reduces the yucky freezer-flavored ice crystals on the food. I'm a gonna need this list . . . have tons of end of season peppers that I need to get busy doing something with. ;) They are a little past their prime. Thanks. woah! this is magnificant! 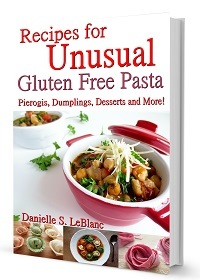 I hATE throwing old ones out, but am so happy that you linked this up at gluten free fridays or I would have never found it! Thank you:) I especially like the dehydrating idea! I like the idea's will have to use some of them. Thanks for the tip! No one's mentioned a toaster oven so far. I am so stoked! I am almost certain you took the peppers in your pic right from my fridge! Thanks so much for this timely revisit on peppers :-) I was just heading to fix a bite for the kids when I saw this post so while I am in the kitchen...! Lol, yes I think most of us periodically end up with a few of these knocking around in the back of the fridge, getting nasty looking! 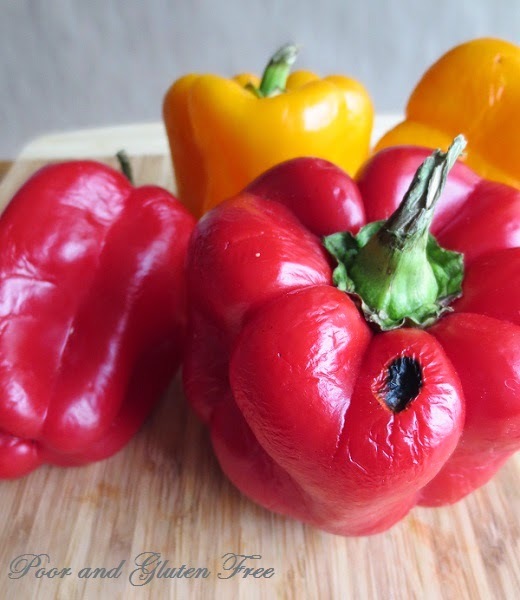 I harvested my bell peppers a couple of weeks ago & I usually eat them raw (I love bell peppers) or use them as a chip to dip into my fire roasted pepper hummus. I've been freezing them for years and my boys (12 & 13) prefer snacking on them frozen. I was looking to see how I could can them in oil & your blog has a perfect way to do just that. Thanks for all of your suggestions. I'm also going to try that soup.... YUM! Hi, have you tried the Nigella's chilli jam? It doesnt contain gluten but uses peppers and chillies and sugar jam (I find sugar jam too expensive so use ordinary sugar with a jam setting agent which contains pectin, sucrose and citric acid). Hi Henry, no I haven't, but it sounds great! I just did a quick google search for it and also found this simple recipe modeled off of Nigella's but it uses apples and sugar instead of jam sugar, which sounds like a great, natural alternative and perhaps similar to what you do? http://www.alifeofgeekery.co.uk/2013/09/sweet-sticky-chilli-jam.html I'll have to give it a try when peppers are in season again! You can also just cut them in strips and saute' them in a pan with a little olive oil. Then freeze them in a bag. They are easy to break apart to take just the amount that you need at the time and return the rest to the freezer. I live in Texas so whenever I can avoid using the oven, which heats the house, I do! That's a great idea, Lyn! And I agree, when it gets hot in Wisconsin in the summer the last thing I want to do is be anywhere near the kitchen, so sauteing is a good alternative. Thanks for sharing! Love your ideas! I've been freezing excess green peppers from my garden, washed, seeded, and cut in strips, but love the roasted ideas for soft ones, which I have plenty:) The best ones, Ive blanched for 3 minutes, then filled with a cooked meat & rice stuffing, then frozen until solid, then wrapped individually or together in a aluminum pan (wrapped in plastic wrap and foil, and frozen, but only use the best ones for that and have a lot that are softened. About that soup, do you roast all the ingredients together, than puree them first? How about using sun drying method for this type of peppers? I see that way is quick and easy to do! I think that's a great idea, too! Or a food dehydrator. I live on the West Coast where sun is not common enough to consider sun drying, way too much rain!! ;p Though I would be extra careful about any molds with drying and dehydrating, especially if the peppers already have moldy spots.